The students at Arizona State University have devised a very clever way of lowering the points on the opponents scoreboard at their home basketball games. 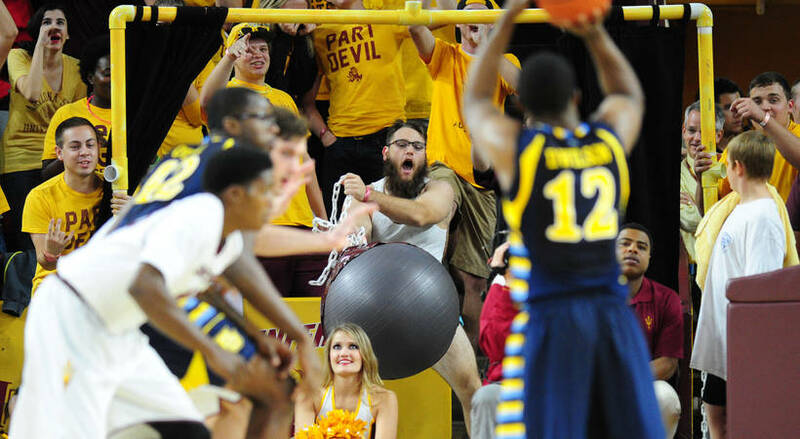 When it is time for the opposing team to shoot a foul shot the students unveil the black â€œCurtain of Distraction.â€ When this curtain is opened it reveals all kinds of college-devised tomfoolery. These distractions range from a Miley Cyrus wrecking ball montage, kissing unicorns, or a robust boy dressed in a diaper. 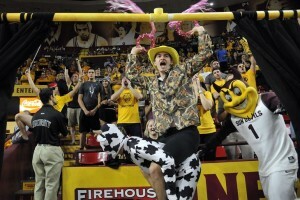 If it is bizarre it will serve itsâ€™ purpose of keeping the points off of the scoreboard. 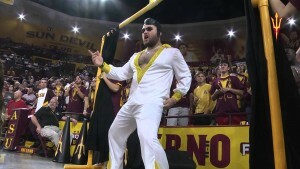 ASU coaches love it because it has resulted in lowering the average opposing foul shots by 2.5 points per game. Do you ever feel like the basketball player trying to do your job of getting points on the scoreboard only to have the opposing team open up a â€œcurtain of distraction?â€ You never know what is on the other side of curtain, and it could be anything. In life there are all kinds of bizarre life circumstances and wild opportunities. Have you known the sound of the ball hitting the rim and rolling out? Brick. Air horns, waving plastic inflatable tubes, and kissing unicorns all conspire to distract you. Know what you want and focus on that alone. There are a million good things you could put your hand to accomplish today â€“ but there is only one thing that should capture your undivided attention in this moment. Knowing what you are trying to accomplish will help you recognize the current interruption as a way to move your project forward or if it is yet another thing seeking to pull you off task. Prioritize â€“ put that which is the most important first. Donâ€™t allow the urgency of the moment to overshadow your long range goals. Some people map out their whole week at one time. Others the night before map out their day. Still others start their day with a cup of coffee and a calendar and map out what needs to happen that day. However works best for you, taking time to think through your goals, priorities, and dreams each day will help you to stay subconsciously aware of what is the most important. There will be opportunities that pop up and the curtain will be opened. It is your plan for the day that will keep you from staring too long at the tooth fairy with a purple tutu and distract you from the eternal. Your ability to focus when the crowd is screaming will come from many days of practicing with screaming crowds in the background. You will have to deal with interruptions as a constant part of life. There will be people who constantly drop by your office. Incoming phone calls and kissing unicorns are apart of your day so why not plan for them. Donâ€™t max out your schedule and calendar as though they donâ€™t exist. You donâ€™t know the exact time that Miley Cyrus on a wrecking ball is coming into your office but you can count on her appearing some time this week. Build in some time on your daily plan for her to appear. Communicate your plan with others. Communicate your goals with your teammates so that they can help you when the distraction curtain is opened. The goal of a foul shot is to go into the basket. Listen to those on your team when they try to keep you focused on the goal and to steer you away from the kissing unicorns. It is vitally important that everyone know the ultimate goal. Let them know. Help to guard them when the are making the shot list and let them help you when it is time for you to step up the foul line.